FINE FORM: Dancers performing Troy Powell's "Unscathed" during last Sunday's well-attended performance. 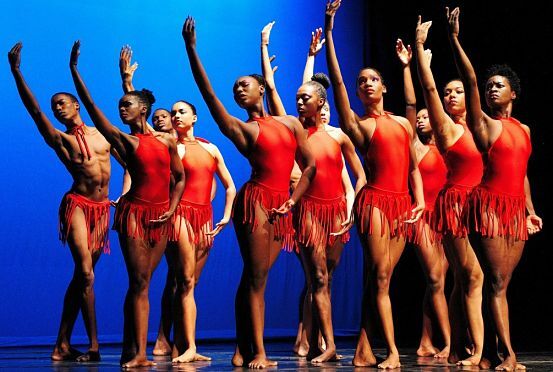 THE single greatest pleasure of a performance put on by the National Dance Theatre Company of Jamaica (NDTC) is that near-seamless blend of exquisite choreography, lithe ands graceful movements and stirring musical accompaniment provided by the NDTC Singers and musicians, led by the innovative Ewan Simpson, their musical director. The mammoth crowd that flocked to the Little Theatre in Kingston this past Easter Sunday for the 36th renewal of the company’s annual Morning of Movement and Music got a taste of quintessential NDTC, thanks to a performance both wonderfully entertaining and immensely satisfying – totally reflective of the holy season. As expected, we were treated to a selection of new and revived works, none more rousing than the exuberant curtain-raiser, set to “The Hallelujah Chorus”, with choreography supplied by Kevin Moore, whose 2017 work “Mercy” (employing seven of the company’s finest dancers and the captivating strains of Jeff Majors performing “Psalm 23”) was a moving depiction of rhythm and technical rigour in sync. And because no NDTC performance is complete without a slice or two of Rex Nettleford-inspired magic, we were happily transfixed by the fresh takes on 1997’s “Tintinnabulum,” fuelled by the robust score provided by Adieumus (also feature on Troy Powell’s brilliant “Unscathed” and “Revival Time,” a highly energetic and lavishly costumed (dazzling white) offering backed by traditional orchestra accompaniment from Chalice, before “Psalm 150” (with classic musical arrangement by Noel Dexter) brought everyone together for a memorably fantastic finale.